Glass mosaic vs marble tiles kitchen backsplash – comparison chart. Which kitchen backsplash is better? Glass tiles are manufactured in variety of colors and shapes. Marble is a natural stone with its unique look and stylish color pattern. 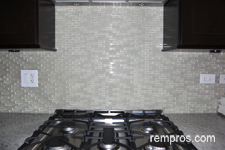 Multicolored glass mosaic or clear glass tiles is a great choice for tiling kitchen backsplash. Polished marble tiles are good for any interior or exterior renovation projects. Glass is non-porous material and insusceptible to stain. 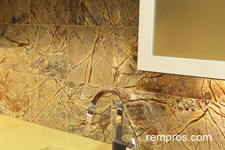 Marble is porous material, but with periodical sealer applications stone tiles have good stain resistance properties. Marble tiles are extremely durable. Surface of marble tiles could be scratched with sharp objects. Glass is very long lasting material with 100 + years life expectancy. But longevity of glass mosaic backsplash greatly depends on installation quality and adequate post installation care. Proper installed and adequately maintained marble tile backsplash will last for decades. Low maintenance type of kitchen backsplash. Marble tile kitchen backsplash requires minimum care after installation. Regular cleaning and periodical sealer application will ensure long lasting performance of natural stone tiles. Greatly vary. Some glass mosaic tiles are relatively cheap while others could be twice more expensive compare to natural stone tiles. In general marble tiles are not cheap, but natural stone tile could be cheaper in comparison with stylish glass tile. Depends on work complexity. Often cost of glass mosaic tile backsplash installation is higher compare to installing marble tile kitchen backsplash. Installation cost greatly depends on backsplash design. Creating unique backsplash style with different in size marble tiles could be an extremely costly project. Greatly vary. Experienced tile setter typically is able to install 35 – 40 square feet of glass mosaic tile on 12” x 12” mesh in one day including grout application. Complex custom work could take a few times longer. Installation time mainly depends on difficulty of work. Professional tile installer might perform basic installation of 32 – 37 square feet marble tiles on kitchen backsplash in a few hours. At the same time, creating stylish pattern with marble tiles could take 3 – 4 days to finish the work. 1 Rating was estimated on the scale from 1 to 5, accounting 1 as lowest and 5 as the highest quality of a product. Always consider the fact: not all products made equally the same and performance of certain material significantly depends on individual product quality, adequate installation, and proper maintenance. Which tile is better for kitchen backsplash? Glass mosaic and marble are great tile options for kitchen backsplashes. Glass tiles are widely used for creating unique patterns on walls. It is easy to clean and long lasting material. Marble with its distinctive natural stone look is very customizable material which perfectly matches with any kitchen decor. Which tile is better to purchase for kitchen backsplash often depends on personal preferences and budget set.